Sweet William (Dianthus barbatus): growing, planting, caring. Perfect for borders, rock gardens and country cottage-style gardens. 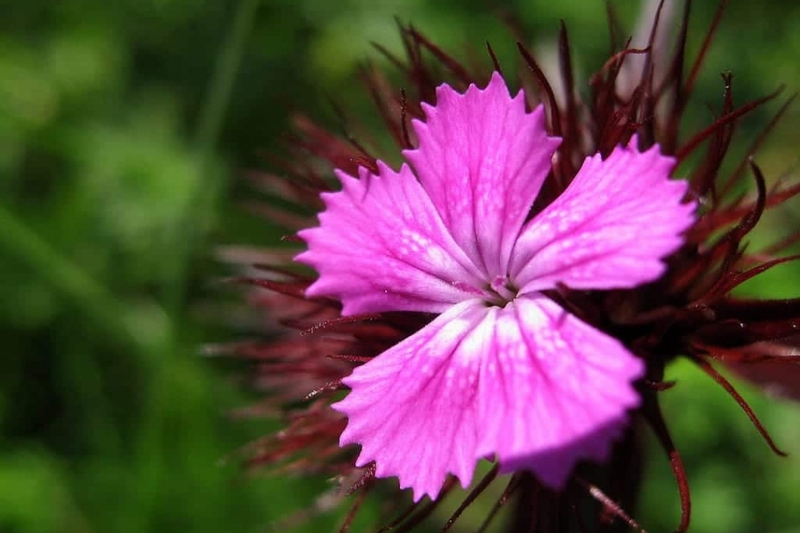 Dianthus barbatus - Sweet William - is a species of Dianthus native to southern Europe and parts of Asia. It is a herbaceous biennial or short-lived perennial plant growing to 12–90 cm tall, with 2–3 cm diameter wide flowers in a dense cluster, with five petals displaying serrated edges. Wild plants produce red flowers with a white base, but cultivars range from white, pink, red, and purple to variegated patterns. It thrives in loamy, slightly alkaline soil with sun to partial shade. Dianthus barbatus is a plant of the genus Dianthus, of the Caryophyllaceae family. It is a herbaceous perennial with a short life, cultivated as biennial. The stems, from 20 to 35 cm high, have long, pointed leaves with a large bouquet at the top, formed by numerous small flowers in high corymbs. The flowers are single or double depending from there variety, rarely of plain color, most often streaked, variegated with colors ranging from white to purple-black. Carnations of poets, perennials used in biannuals are sown in open soil in autumn, or under shelter in March, to obtain a bloom the same year. Cover them very little, because they need light to germinate. Plant the seedling between two and four weeks after sowing (as soon as the plant is sufficiently developed to be handled). Carefully separate the seedlings and replant them individually in a bucket filled with transplanting soil, or a mixture of soil and well-decomposed compost. Water copiously at the plantation, then every day during the first weeks. About two months after sowing, and 6 weeks after transplanting, the plants have grown strong enough to be placed in the open soil. Plant them in finely worked beds (spaded, scratched and raked), when the last spring frosts are over. Once the bed is properly prepared, make a small hole with a transplanter, remove the plant from its bucket, put it in the hole, and compact the soil to put it in contact with the roots. Respect a spacing between the plants corresponding to one third of its intended width. Water copiously to promote rooting. Mulch as soon as the sunny days are back to make your life easier, and save water! Dianthus barbatus is multiplied by seed, so think of harvesting seeds in summer, and sow them under shelter from February. Be careful, hybrids often have low fertility, so you may have to buy new seeds.